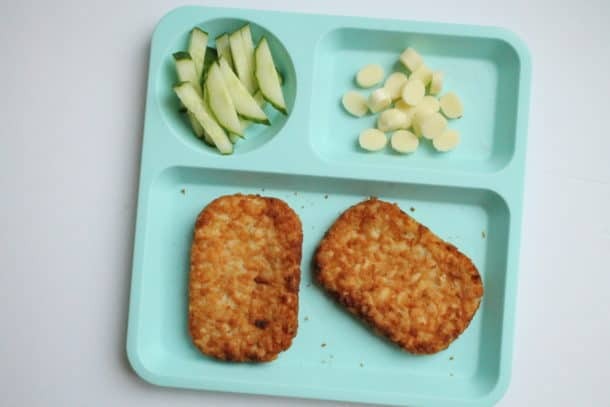 Huge list of toddler and baby meal ideas. Perfect for baby led weaning, transitioning to table foods, or toddlers. Meals the whole family can eat. 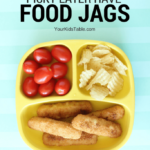 Three years ago I wrote a big list of baby finger food ideas (when my second child was in this stage), and it has remained one of the most popular posts on Your Kid’s Table to date. I know parents are looking for baby/toddler food inspiration! I wanted to take this post a step further and share whole toddler and baby meal ideas here, now that my youngest guy is 9 months old and I have been re-inspired. 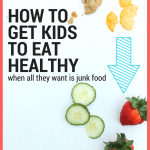 Of course, you can bet that I’m going to give you a few tips from a therapist’s perspective because this is an integral time in getting your child to establish good eating habits. 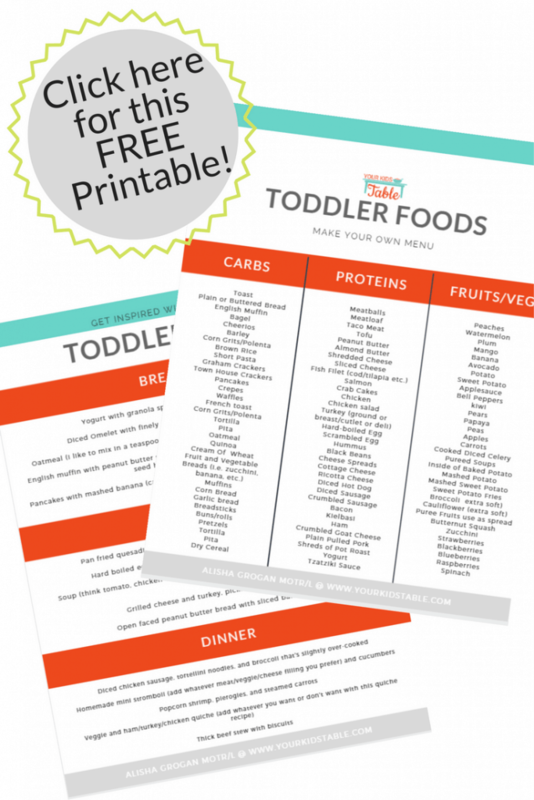 You’ll also find a Free Toddler Meals Printable at the end of the post. Perfect to hang on your fridge! First and foremost, I want to remind you that every baby develops differently, and some 9 month olds aren’t quite ready for all these foods. If you aren’t sure if your baby is ready, I would highly recommend reading How to Transition Your Baby to Table Foods. I go into a lot of detail on signs of readiness and how to progress through to this point. I will say here that, once your baby is eating puffs, cheese curls, and graham crackers with good chewing and infrequent gagging they are likely ready for foods in this list. If you are following a Baby Led Weaning approach this may be as early as 7.5 months. 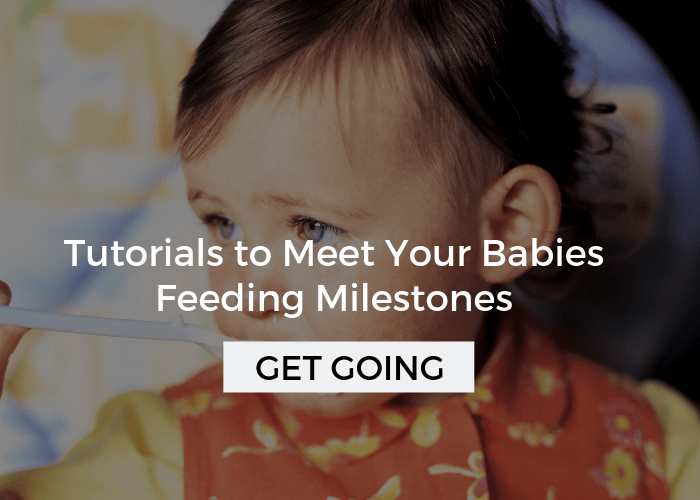 On the other hand, if you are following a more traditional pureed foods method, your baby may not be ready to eat these foods until 10.5 months. 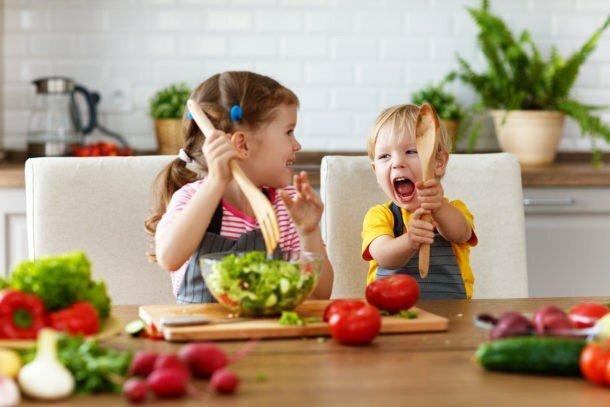 While I do strongly believe that we shouldn’t compare our children and let them develop on their own pace with encouragement, it is important that they begin eating some table foods by 11 months. Otherwise, they may miss a window of time where they reflexively learn how to chew. Obviously, the skill can still be learned, but it is usually more difficult. 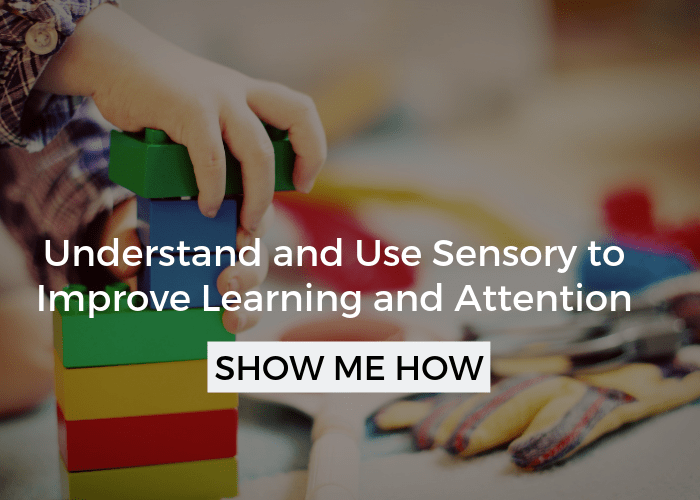 I would recommend getting an evaluation with early intervention (it’s free!) to rule out any underlying difficulties if your baby is older than 11 months and are refusing all table foods. Please note that many pediatricians aren’t trained in feeding, and they commonly tell parents that babies will eventually learn on their own or to just stop offering them baby food and they will get it in time. I am not a fan of the wait and see approach, and advise against it. I know many of you are petrified of choking, and while it is obviously important to be aware of it and know how to handle it, I don’t want you to avoid feeding your child food out of fear of it. I would recommend taking an infant CPR class or at a minimum educate yourself with this online resource. If you are uncomfortable with any of these foods, skip them. I have avoided all of the major choking hazards which are: whole grapes, popcorn, whole pieces of hot dog, whole cherry tomatoes, and nuts. If you see peanut butter, note that it is spread thinly and not given in large dollops. Also, keep in mind that gagging and choking are two different things. Gagging is normal and is often a sign that your child didn’t chew the food enough or lost track of it in their mouth. If they are gagging frequently, they may be having difficulty tolerating some textures or knowing how to chew. In this instance, a feeding evaluation would be valuable. Choking is when a piece of food is caught in their throat. If this happens, they will not make any sound. I try to offer my baby a carbohydrate, fruit/vegetable, and protein at every meal. He also always has water in a straw cup. In addition, I make an effort to give him various textures and opportunities to feed himself with his fingers and accept food from a spoon or fork (the latter of which happens less often). Generally speaking, I prefer diced foods that are about half the size of a dime (larger for toddlers), or stick shaped foods. Also, babies and toddlers tend to do well with foods that are grinded, shredded, or minced into patties or breads. Think meatloaf or zucchini bread. Although, all food shouldn’t be presented in this way or they may come to depend on it. Babies and toddlers and appetites fluctuate drastically. It is important to trust their instincts, and not overly cater to them. See this post on portion sizes for lots more specifics from a dietitian. I have organized these meals into categories for ease of use, but it really doesn’t matter if you serve sloppy joes for breakfast or yogurt for dinner. I’m more concerned with a balanced meal that includes a variety of food groups and textures. For additional tips on preparation, I’ve included notes in italics beneath. Many of the foods include links to recipes to as well. Lastly, most pediatricians have begun to reverse the previous recommendation of waiting until to 2 years old to eat highly allergic foods like peanut butter and shellfish. If you have any questions or concerns discuss it with them. I introduced my children to all foods as babies and then waited three days before any other new foods were introduced. Yogurt with fruit/veggie puree mixed in and apple straws. I like to use plain yogurt and mix in pureed pumpkin, banana, berries, mango, etc. That way I can control the sugar. I also add in about a teaspoon of flax seed meal or baby oatmeal cereal. I like to add various fruits into the batter and chia seeds or peanut butter as well. You can add a lot of nutrition to the waffle batter if making it from scratch, just like with pancakes. My favorite is pumpkin waffles. English muffin with peanut butter and sliced papaya. Blend up whatever you have on hand and mix right in for added sweetness. You can spread egg right onto toast and cut it up as well. *Check out more at the greatest toddler breakfast ideas. Check out toddler lunch ideas for even more ideas specifically targeted to lunch at daycare or home. Healthy and easy ideas also included! The casserole includes shredded chicken (or ground beef), tortillas, and beans can be added. Everything is very soft. You can make homemade hummus by blending chick peas, olive oil, and cumin together. Be careful of processed versions with many added unnatural ingredients. Most American babies are very sensitive to spice. You will have to look for a mild version of sausage. Apple, maple, and sun-dried tomato sausages are often very mild tasting. Grilled cheese and spinach sandwich with diced pear.I like to use a creamy gouda and a few leaves of fresh spinach. Breaded chicken tenders, sweet potato fries, and papaya. I use whole wheat tortillas, ground turkey or beef, cheese, and diced tomatoes. I heat on a skillet or griddle so that it is crunchy and cut into small squares. I look for high quality wild Alaskan fish or make my own. Noodles with salmon, finely chopped spinach, olive oil and parmesean cheese. Make this in one pot and add olive oil and seasonings to your liking. It all sticks together and can be easily fed with a fork. Or, use penne or rotine shapes and leave whole, allowing your child to finger feed. Brown rice cake with turkey and cream cheese spread on top. Serve with diced grapes. Try lots of variations. Make home-made. Use different soft cooked veggies on top like mushrooms, green pepper, and tomatoes. Be sure to include veggies in your quiche and won’t have to serve them separately at this meal. Also use banana, zucchini, blueberry breads, etc. I will serve this from a spoon and chop up a bunch and just place right onto the tray. 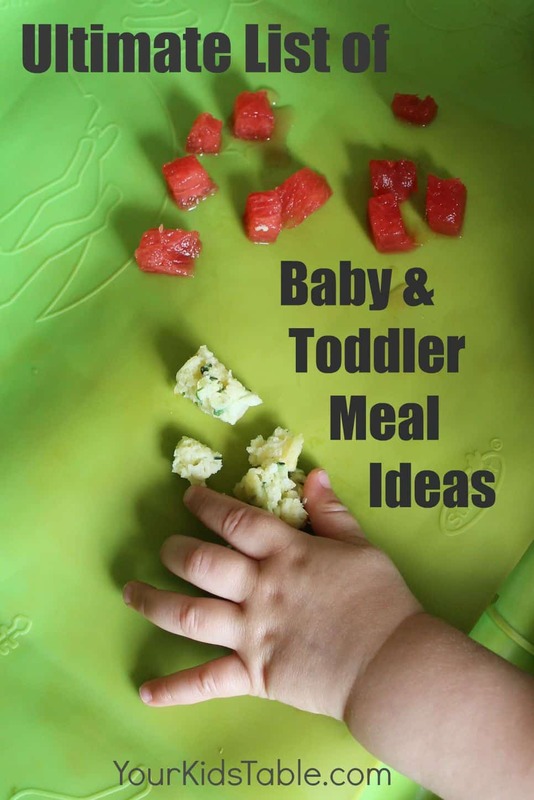 *If you want EVEN MORE ideas head over to Toddler Meal Ideas, I especially focused on meals for older toddlers in that post! 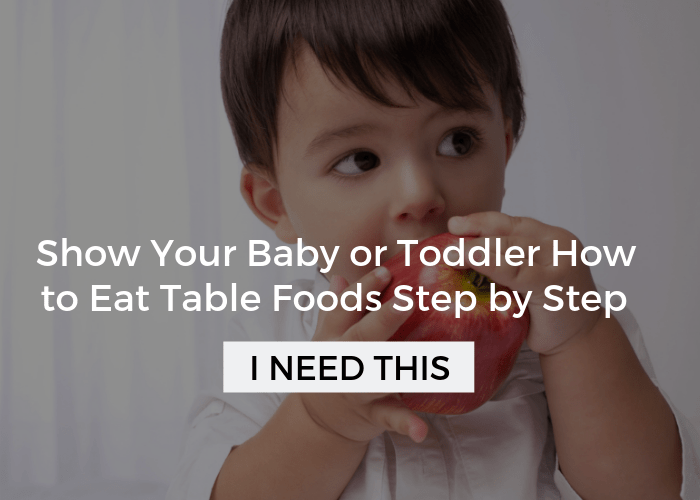 Try to have everything ready before your baby comes to the table. Get them used to meals by everyone sitting together at the table. Try to have at least one food at every meal that you expect your baby to eat. Don’t expect them to like everything, every time. My baby often refuses potatoes and noodles, for example. This is totally normal and does not mean they are a picky eater. Keep trying! 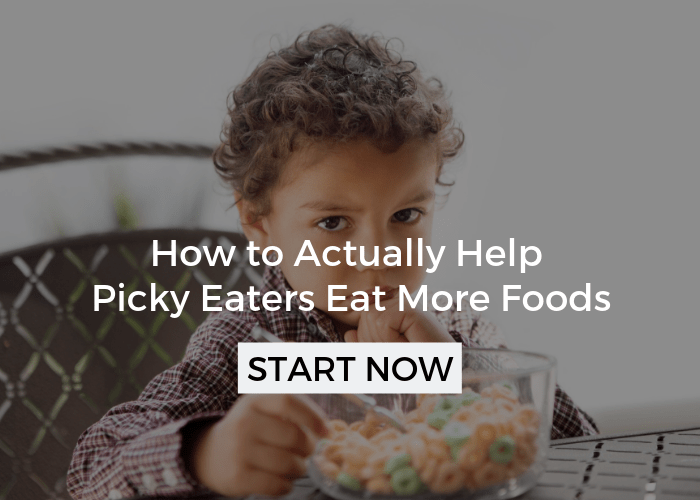 If you are concerned that your child is being too selective about their food, read about my top tips for good eating habits and how to know when picky eating has gone too far. 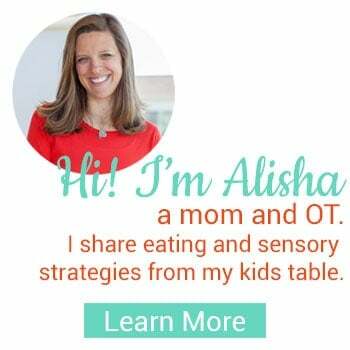 Take opportunities at parties and restaurants to expose your baby or toddler to new foods. Head to High Calorie Food Ideas for Babies if you want or need to focus on weight gain. You’ll find tips for getting the most calories out of every meal, too. Of course, this isn’t necessary for most babies and toddlers. Use this tool from FunBites that cuts your toddler’s food into even square (or other shapes) pieces easily and quickly. If your feeding a baby the pieces may need cut in half again so they are small enough. Just click though right here, and I’ll send it right to your inbox! Hover over an image to save it! Hi Kerry, Sorry for the confusion. I’ll email you the printable again. I just don’t understand! This list is awesome but I just feel stumped, how to you prevent from having a huge mess as if you have just specially prepared a gourmet meal. Between making the food, cleaning up from making the food, cleaning up my child, cleaning up the mess my child has made and trying to get him to actually eat anything I swear I’m losing my mind. Also when you make these things how do you not end up wanting a ton of the food! My one year old is being especially difficult with his new love of spitting things everywhere since he learned to blow!! Help!!!! Thank you so much!! 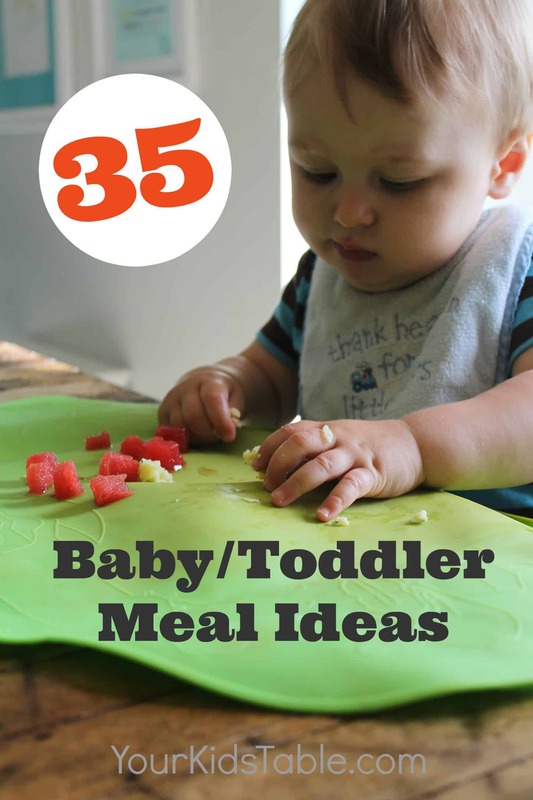 This is an incredible resource in thinking of food ideas for our babies! My guy is 8 months old and is LOVING everything I put in front of him.. but I run out of ideas for dinners at home and lunches and breakfasts for daycare. Thank you! Thanks so much! I’m so glad to hear that! Thank you so much! This list I see incredible! My 8 month old is getting serious about wanting to feed himself. This is a perfect resource! I can’t print the meals?? It may have gone into your spam or promotions folder, I’ll help you figure it out and make sure you get it! Yup Jennifer, start out by adding the smallest amount of sauce, so it’s barely noticeable. She’ll likely accept that, after a few successful attempts she’ll likely tolerate a little more sauce, slowly building more. You can also try to offer it as a dip on the side and show her how to dip a macaroni noodle in using her fork. Lastly, make sure she can handle getting messy in general. Give her chances to finger paint, play in soap/foam, etc. Once she can handle touching a variety of textures she’ll likely pick them up to eat them too! Awesome post – gave me lots of ideas! Off to Whole Foods now!! You are exactly right! I got mine at Babies R Us years ago but have bought them recently. On amazon it says they are being discontinued but you can still get them. They are called Kiddopotamus Tiny Diner Travel Mat. You aren’t alone Peetie, this is one of my most popular posts, for that reason! You got this! Yay, that’s great Deborah, thanks for stopping in! So great Denise!!! Thanks so much for sharing! Wishing you all the best! Thank you for this list! It’s awesome. Your comment that Pediatricians are not trained in feeding is wrong. Have your reviewed a ACGME accredited residency curriculum? If you have you would see that it is an obvious part of a General Pediatricians training. I’d update your blog so your Peds colleagues won’t be offended. Most are trained in feeding development, and any additional training is minimal on problem feeding techniques. While I have come across a few of them that have taken further education, sadly, for the entirety of my career the vast majority have given poor, non-evidenced based advice and brush the parents off unless the child is losing weight.